The following is a guest blog feature from Bill Williams, Head of North American Sales for Telefonix EV Charging Stations. Now that electric vehicle owners are a few years into the learning curve, clear trends are emerging related to driving habits and charging needs. 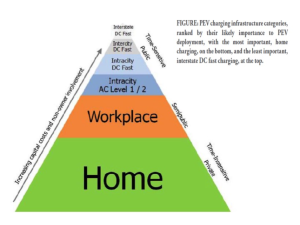 As public and private agencies seek to install the “right” infrastructure for EVs, there is one rule moving to the forefront of these discussions, applying to all vehicles regardless of the drivetrain: Cars are parked longest (1) at home and (2) at work. I have been in the industry from the beginning and feel we are past the tipping point for EV acceptance, but we still have work to do. One experienced driver giving a test drive to a neighbor, fellow worker or a complete stranger can make a huge impact. We all have a part in this! I love the idea of all of us working towards accelerating EV Adoption. So what have we learned so far, and what do we need to adjust? The latest thinking suggests that outside of charging EVs at home, infrastructure efforts are best focused on the workplace. This is what many of us in the industry have been fighting for, and support is gaining steam! Just released this week April 23, 2015, the briefing, “Overcoming Barriers to Deployment of Plug-In Vehicles,” conducted by the National Research Council and commissioned by Congress, looked into the barriers facing the proliferation of plug-in vehicles and recommended that the government do more to encourage their adoption, including funding research into better batteries and establishing industry-wide standards for charging infrastructure. This chart below, from this briefing, shows EV Charging in order of likely influence. 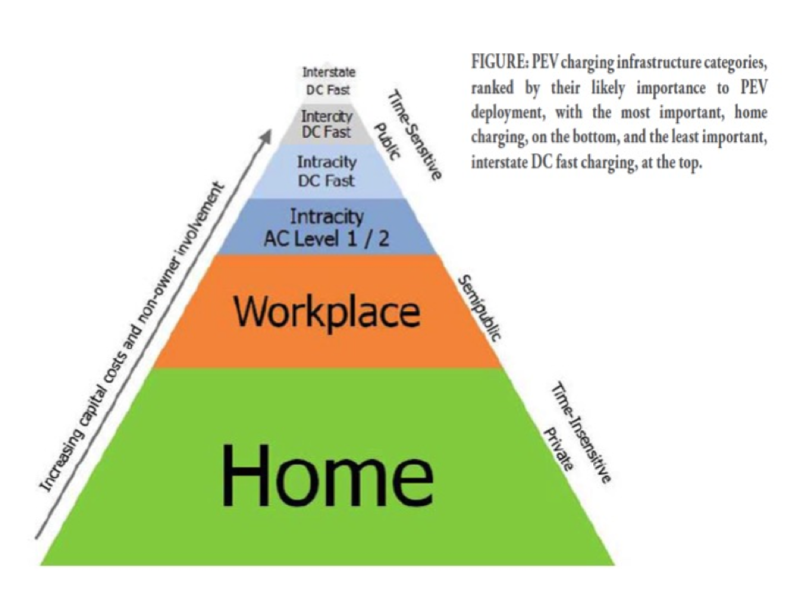 This shows that next to the home being the most important, that (again) the workplace is more influential than all of the public charging options. We all “think” that more public charging is needed, but what is the actual mix? This is an ongoing learning curve, but the results are showing that we can focus on less expensive and less complicated installations at home and work. Nissan has revealed that there is a decrease in Level 2 installations in homes of LEAF owners. It was over 80 percent 2011, and now has dropped to less that 50 percent in 2014. This means that they are using the Level 1 cord that came with the car, and using the DC Fast Chargers as needed . This is a trend to watch, for sure. As the EV market matures, we have hit a “fork in the road.” The focus for public charging of electric vehicles is shifting in one direction to low-current, less costly home and workplace charging, and the other direction is DC Fast Charging. We are finally focusing on “parking vs. fueling.” These two arenas seem to be the new focus of charging stations—low-current charging for long-duration “parking” and high-current charging to continue an ongoing trip, or “fueling.” The chances of seeing new charging stations at your local drug store, for example, are becoming slim, unless they are intended for the employees. Considering that most cars are parked at work all day, this makes perfect sense. The vast majority of electric vehicles leave home each morning with a fully charged battery. 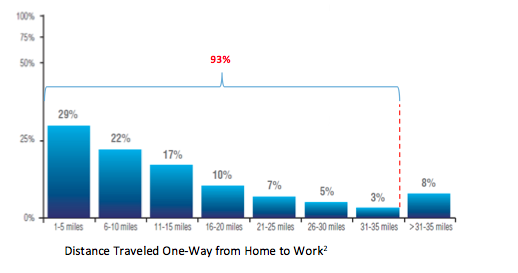 Seventy-eight percent of drivers commute less than 20 miles one-way to work each day2. Ninety-three percent commute less than 35 miles. The range used for the daily commute can easily be regained using low-current, less costly charging at the workplace. Employees that are able to plug in at work are 20 times more likely to drive a plug-in vehicle. Most battery electric vehicles (BEVs) have a range of 80 to 100 miles and are capable of making the round-trip commute to work and back. Longer range EVs could further diminish the demand for fee-based public charging possibly increasing the need for low-current charging at work. Even when the 300 mile range cars arrive (and they are coming), like the cordless phone, they must go back in the cradle to stay at a full charge. I like to think of the “A.B.C.” method that was a mantra I learned from the pilot group of Mini E owners. “Always Be Charging”. Low, and slow will work to keep current EVs “topped off” too. We are increasingly learning where the focus and the funds should go. In the past, we tried to sign up any location with a parking place to install public charging stations. This, unfortunately, could prove to be an expensive lesson. But in hindsight, we tried, we sometimes failed, and we need to learn from it. We need to be more efficient with our infrastructure dollars! All indications tell us that rapid proliferation of electric vehicles and workplace charging will be a key factor in their advancement. Long-dwell locations, like home, work, airports, and hotels are all common-sense locations with the most effective impact, not to mention less expensive in most cases. I hope we can all work together to educate and help create a new generation of EV adopters, who know that you don’t need to be a tree-hugger to fall in love with EVs. For this “sustainable business” to go mainstream, we need to make our efforts and spending sustainable too. Let’s hit the “insane” button and make this happen! To learn more about workplace charging and how you can join the Northern Colorado Workplace Charging Challenge click here. Bill Williams has been helping propel the electric transportation movement in the United States since 1995. As one of the first dealers in the Western US to sell neighborhood electric vehicles (NEVs), Bill’s career has focused on the Alternative Fuel Transportation industry from the beginning. Past positions include Regional Vice President of EVI and Vice President of Sales in North America for ZENN Motor Company, as well as Operations Manager with Clipper Creek. Most recently, Bill is working with commercial EV charging stations at Telefonix Inc. as their Head of North American Sales. You are welcome to contact him at bwilliams@telefonixinc.com. Source: U.S. Department of Transportation, Bureau of Transportation Statistics, Omnibus Household Survey (2014).